Canada’s second largest airline WestJet believes it can attain a positive unit revenue result in 1Q2017, joining many other North American airlines in outlining specific timeframes for the reversal of negative trends. Unlike performance of most airlines in the region that are predicting sequential improvements from 3Q2016 to 4Q2016, WestJet’s performance will worsen during the last three months of 2016. The factors driving WestJet’s deeper unit revenue decreases include timing of the year-end holidays, competitive capacity pressure in warm weather markets, and fare matching of the start-up competitor ULCC NewLeaf. Although WestJet believes it will make an important turn in its unit revenue performance in early 2017, it faces some cost inflation for the full year as it adds a larger number of smaller Bombardier Q400 turboprops, which have higher operating costs but in fact also help drive bottom line profitability. Although at this point WestJet cannot forecast its unit revenue performance for FY2017, its goal is to post unit revenue growth that outpaces unit cost increases. WestJet is planning markedly lower year-on-year capacity growth in 2017, in the mid-single digits, and foresees a better economic environment after battling tough conditions in Alberta during the last couple of years. Those two factors should help to power WestJet’s efforts to achieve positive unit revenues. WestJet posted solid sequential improvement in its unit revenue and yield declines during 3Q2016. The company’s 2.7% decline in unit revenue leaned toward the higher end of its previous forecast of a 1% to 3% decrease. But WestJet is facing unit revenue headwinds in 4Q2016 as it projects a unit revenue decline of 4% to 6% – which is still an improvement over its performance in 1Q2016 and 2Q2016. WestJet attributed 100bp of its 4Q2016 unit revenue decline to the shortening of year-end holiday season travel, a challenge many North American airlines have cited in their unit revenue forecast for the last three months of 2016. The airline also cited discounting by its rival Air Canada in warm weather markets, and – to a lesser extent – price matching by the start-up competitor NewLeaf Travel. NewLeaf launched operations in Jul-2016 with aircraft operated by the charter company Flair Airlines. NewLeaf is the first of three aspiring ULCCs to launch operations in Canada. The Canadian government recently approved a request by NewLeaf’s would-be competitor Jetlines to increase foreign investment to 49%, from the current cap of 25%. NewLeaf recently outlined plans to launch seasonal flights from Dec-2016 to Jan-2016 out of Westjet's largest base and headquarters at Calgary: to Abbotsford, Toronto Hamilton, Halifax and Moncton. WestJet operates in three of those markets – Abbotsford, Hamilton and Halifax. WestJet acknowledges its ASM overlap with NewLeaf is less than 1.5% of the larger airline’s system ASMs; however, WestJet has made it clear that it intends to compete fiercely with any new competitor. 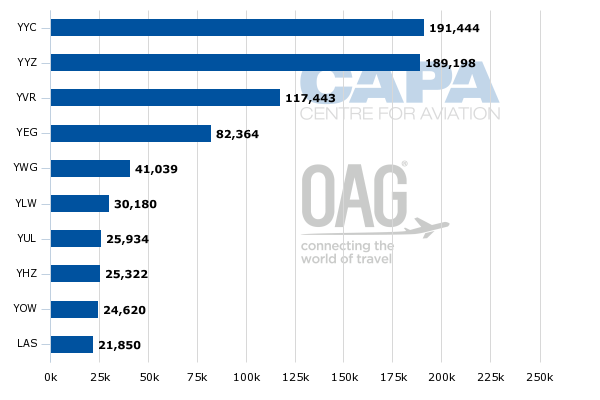 Company CEO Gregg Saretsky recently commented, observing that Canada is a sparsely populated country and there has not been any time in Canadian aviation history when more than two airlines could operate profitably. “We have the cost structure and the balance sheet and the loyal traffic base that we will defend our franchise, and so we’re going to match whatever prices our competitors put in the market”, Mr Saretsky stated. WestJet’s unit costs excluding fuel and profit-sharing are projected to increase 3% year-on-year in 2016, and the company’s forecast for 2017 is growth of 2.5% to 3.5%. The company has calculated that approximately half of the cost increase forecast for 2017 is fuelled by higher growth levels in its Q400 fleet, operated by WestJet Encore. Other cost drivers include a higher number of heavy maintenance checks and expense driven by a new international terminal in Calgary. 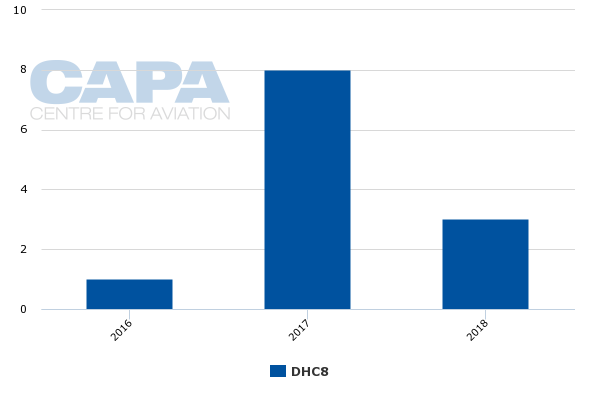 CAPA’s fleet database shows that Encore operates 33 of the turboprops. Orders include those placed directly by the operator and by lessors assigned to the operator, from 8-Nov-2016 onwards. Encore’s delivery forecast for 2017 is for eight aircraft, compared with six Boeing 737 narrowbodies for WestJet mainline. There are also six 737 lease expirations scheduled for 2017. Aircraft operated by subsidiaries/associates of the main airline may be listed separately. Firm orders include those placed directly by the operator and by lessors assigned to the operator, from 7-Nov-2016 onwards. Excludes aircraft for which the delivery date has not been announced, cannot be reasonably projected or is unlikely to be delivered. The smaller-gauge 78-seat Q400s have higher unit costs but also generate higher unit revenue, which will be key for WestJet in 2017 given its projected cost inflation. The airline has made assurances that its goal for the year is to ensure that unit revenue growth outpaces increases in unit costs. There are industry dynamics that WestJet believes will differ from 4Q2016 to 1Q2017 (when it aims to return to positive unit revenue), and they include the airline returning to a more normal schedule from Alberta to warm weather destinations, versus a shorter operating period in 2016 due to the province’s deteriorating economy. WestJet also cited strengthening demand in Western Canada and lower transborder capacity by US airlines due to the depreciation of the CAD against the USD. In early Nov-2016 the CAD was trading at 0.75 to the USD. Furthermore WestJet expects to be buoyed by an increase in its charter business, noting that fixed blocks of capacity should create some benefit. WestJet’s system capacity forecast for 2017 of 3.5% to 5.5% growth is markedly lower than the 9% increase in ASMs planned for 2016. Source: CAPA - Centre for Aviation and airline reports. 1 Y-t-D for January to September 2016. Throughout 2016 WestJet has fielded questions about its capacity growth, and the airline has continually stressed that the bulk of 2016’s growth was attributable to the introduction of nonstop long haul service to London Gatwick, using Boeing 767 widebodies. Stripping out the 767 operations, WestJet has calculated its 2016 system capacity growth is increasing 1% to 3%. 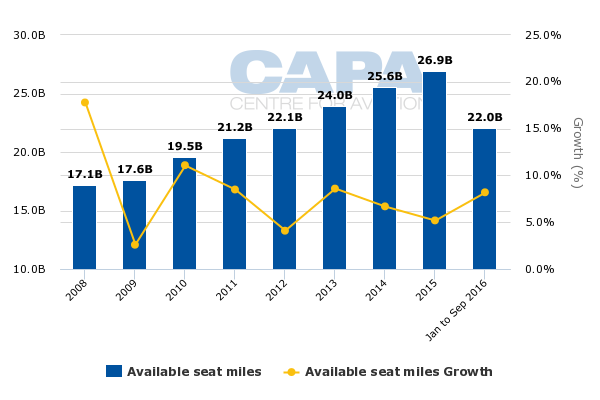 WestJet’s planned lower capacity growth for 2017 should create some reassurance for investors as Canada’s economy should chart some improvement. The company’s forecast for lower capacity growth is against projected Canadian GDP growth of 2% in 2017 (up from 1% in 2016), and the expectation that Alberta should emerge from two years of economic contraction. WestJet cut capacity in Alberta by 5% in 3Q2016, and at the end of 2Q2016 the company remarked that it was holding an internal debate over whether trends had hit the bottom. Its outlook seems to have improved as 2016 draws to a close, and Alberta’s economy shows signs of beginning to recover in 2017. After posting capacity growth in the high single digits during 2016, WestJet is slowing capacity in 2017 as it works to meet its targeted deadline for a return to positive unit revenue. Similarly to many North American airlines, WestJet is facing cost inflation that is perhaps making a swing to positive unit revenue more pressing. WestJet seems to understand the necessity of ensuring that its unit revenue and yields grow faster than unit costs excluding fuel and profit sharing in 2017, and investors are looking for the airline to deliver on its unit revenue promises.